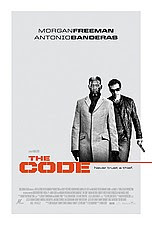 XanaX have just released a DVD rip of a fairly unheard of (to me anyway) but decent looking crime movie called “Thick As Thieves” AKA “The Code”. There are some well known actors/actresses in the movie including Morgan Freeman, Antonio Banderas and Radha Mitchell. A veteran thief (Morgan Freeman) recruits a younger crook (Antonio Banderas) to help him pull off one final job in order to repay his debt to the Russian mob and save his god-daughter (Radha Mitchell).